Is Tony Stewart the New Jimmie Johnson? 5 years. NASCAR fans endured 5 years of what most certainly will be remembered as one of the most dominant eras of the sport. Year after year, fans complained about how one driver, Jimmie Johnson, was too bland, too nice, and too simple. And he won too much. Way too much. bruton smith has an email address to send your opinion of if they should or not change the track back. i said i would like to see them re reconfigure it back.it was unique. Here is my article for my Fantasy Picks for Bristol. Currently I am 99% in Yahoo Fantasy Auto Racing and Ranked #279 overall in Fantasy Live. Good Luck this week! 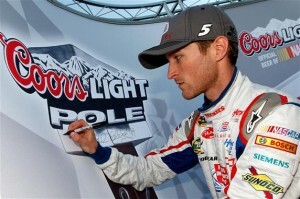 Redemption in Sin City for Kasey Kahne? Yesterday (Tuesday) I was able to interview Joey Logano. He told me about how the changes to his team over the offseason are setting him up for success in 2012, how he would be a hockey player if he was not a NASCAR driver, and the difficulties of racing in the NASCAR Sprint Cup Series at such a young age. Two races are in the books and the drivers are finally starting to reveal what they have for the 2012 season. Just in time for their trip to Las Vegas.